CCSS-M.G-CO.C.9. Prove theorems about lines and angles. Theorems include: vertical angles are congruent; when a transversal crosses parallel lines, alternate interior angles are congruent and corresponding angles are congruent; points on a perpendicular bisector of a line segment are exactly those equidistant from the segment’s endpoints. After proving that vertical angles are congruent, we turned our attention towards angles formed by parallel lines cut by a transversal. My students come to high school geometry having experience with angle measure relationships when parallel lines are cut by a transversal. But they haven’t thought about why. If a straight line crossing two straight lines makes the interior angles on the same side less than two right angles, the two straight lines, if extended indefinitely, meet on that side on which are the angles less than the two right angles. And then traditionally, we have allowed corresponding angles congruent when parallel lines are cut by a transversal as the postulate in our deductive system. It makes sense to students that the corresponding angles are congruent. Then once we’ve allowed those, it’s not too bad to prove that alternate interior angles are congruent when parallel lines are cut by a transversal. But we wonder whether we have to let corresponding angles in as a postulate. Can we use rigid motions to show that the corresponding angles are congruent? Another student suggested translating line m using vector BE. So we really translated more than just line m. We really translated the upper half-plan formed by line m. We used took a picture of the top part of the diagram (line m and above) and translated it using vector BE. 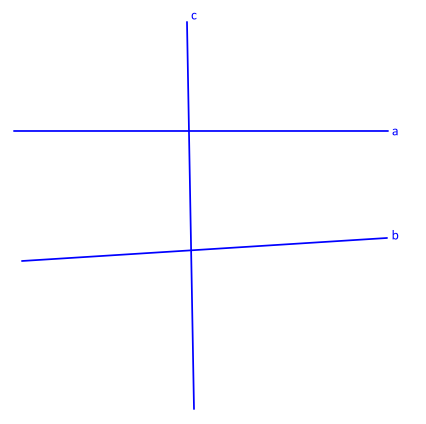 We can see in the picture on the right, that m maps to n and the transversal maps to itself, and so we conclude (bottom left image) that ∠CBA is congruent to ∠DEB: if two parallel lines are cut by a transversal, the corresponding angles are congruent. Once corresponding angles are congruent, then proving alternate interior (or exterior) angles congruent or consecutive interior (or exterior) angles supplementary when two parallel lines are cut by a transversal follows using a mix of congruent vertical angles, transitive and/or substitution, Congruent Supplements. But can we prove that alternate interior angles are congruent when parallel lines are cut by a transversal using rigid motions? 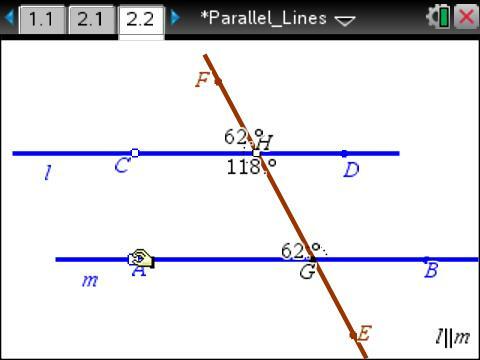 Several students suggested we could do the same translation (translating the “top” parallel line onto the “bottom” parallel line). ∠2≅∠2’ because of the translation (and because they are corresponding), and we can say that ∠2’≅∠3 since we have already proved that vertical angles are congruent. ∠2≅∠3 using the Transitive Property of Congruence. 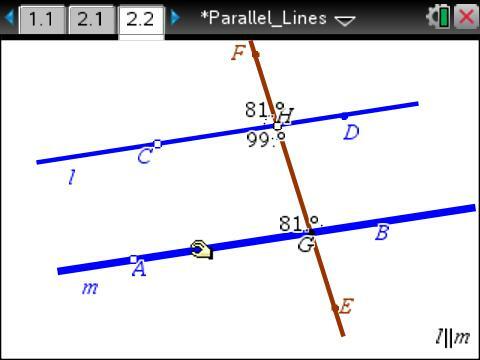 We conclude that when two parallel lines are cut by a transversal, alternate interior angles are congruent. 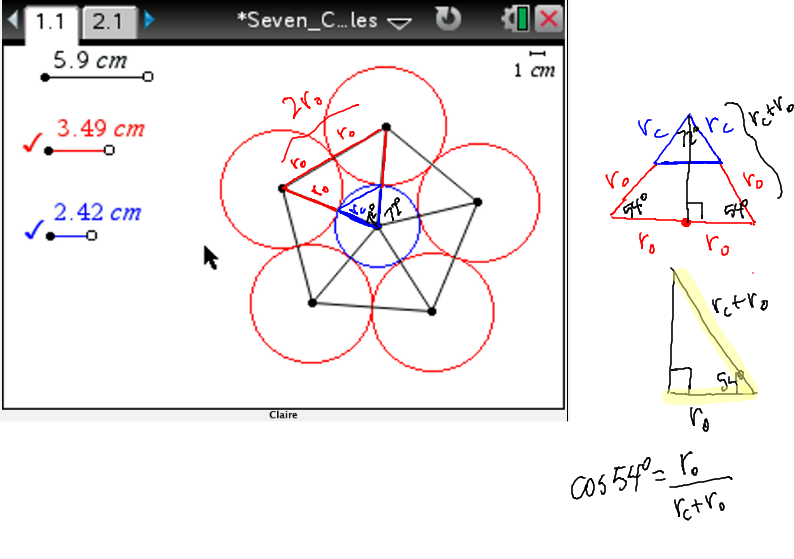 Another team suggested constructing the midpoint M of segment XY (top image). 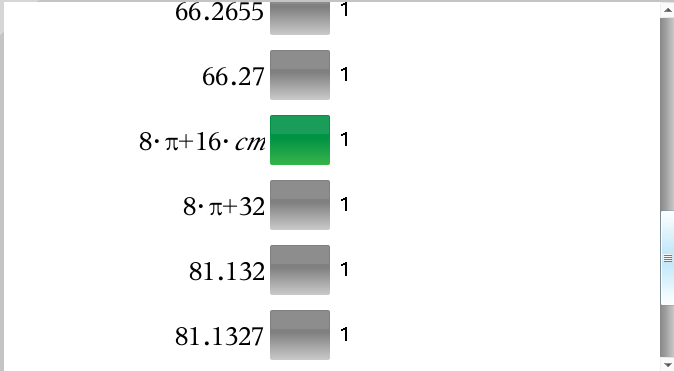 They rotated the given lines and transversal 180˚ about M (bottom image). ∠2 has been carried onto ∠3 and ∠3 has been carried onto ∠2. 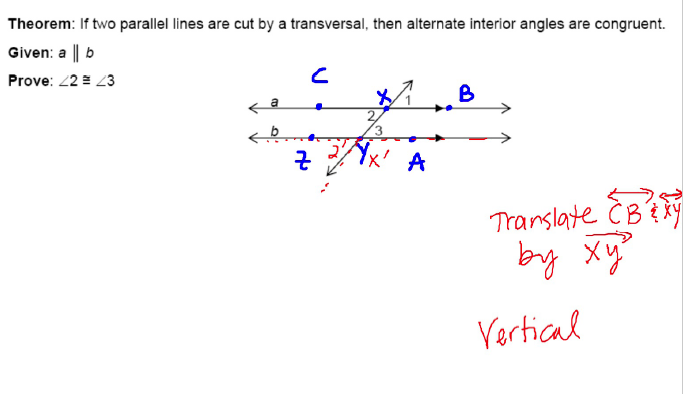 We conclude that when two parallel lines are cut by a transversal, alternate interior angles are congruent. Another team constructed the same midpoint as above with a line parallel to the given lines through that midpoint. They reflected the entire diagram about that line, which created the line in red. They used the base angles of an isosceles triangle to show that alternate interior angles are congruent. Note 1: We are still postulating that through a point not on a line there is exactly one line parallel to the given line. This is what textbooks I’ve used in the past have called the parallel postulate. And we are postulating that the distance between parallel lines is constant. Note 2: We haven’t actually proven that the base angles of an isosceles triangle are congruent. But students definitely know it to be true from their work in middle school. The proof is coming soon. Note 3: Many of these same ideas will show that consecutive (or same-side) interior angles are supplementary. We can use rigid motions to make the images of two consecutive interior angles form a linear pair. After the lesson, a colleague suggested an Illustrative Mathematics task on Congruent angles made by parallel lines and a transverse, which helped me think through the validity of the arguments that my students made. As the journey continues, I find the tasks, commentary, and solutions on IM to be my own textbook – a dynamic resource for learners young and old. I needed to spend some time talking with students about their grades. So they worked on a task while I met with individual students. Which means I wasn’t able to orchestrate as productive of a mathematical discussion as I would have liked. We started with the pictures, absent of any explanation or measurements. 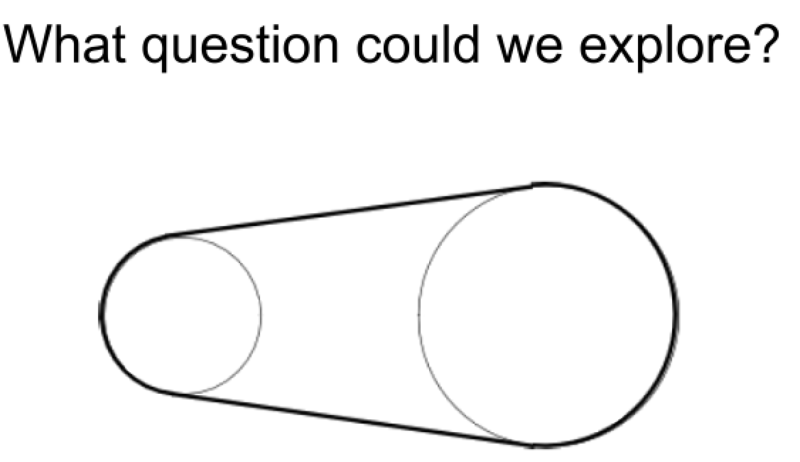 What question could we explore? 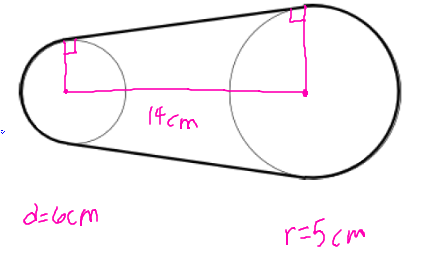 could the one of the bases of the cylinder have the same diameter as the other? Does is help to know that these are two wheels and a belt? Does looking at a picture of some gears help to make sense of the picture? I asked the question again. 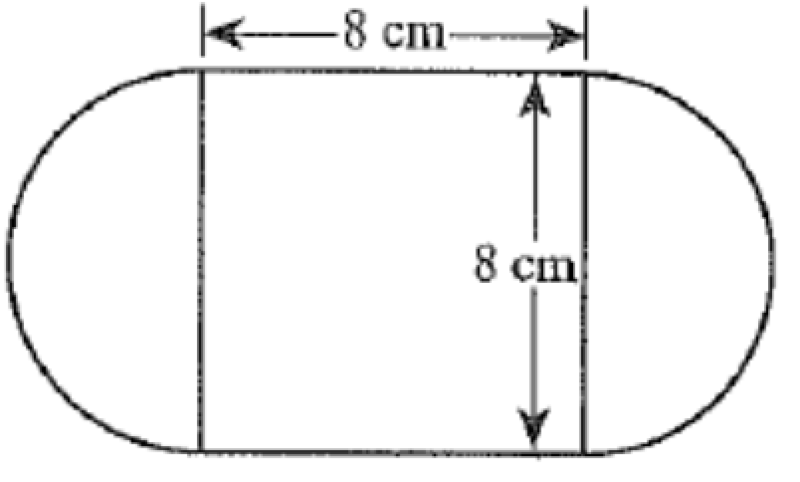 What information do you need to determine the length of the belt? Teams worked together to make a list of measurements. I checked in every few minutes in the midst of meeting with students about grades. I knew some of the misconceptions that students would have because we did this task last year. Students had the opportunity to look for and make use of structure. Is the quadrilateral a rectangle? Many students were calculating as if it were. Someone convinced us that the quadrilateral is only a trapezoid. Students corrected calculations and made more progress. 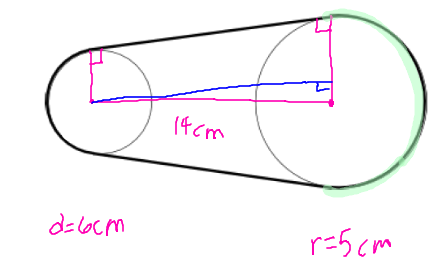 Is the part of the belt highlighted in green a semicircle? Someone convinced us that the arc is greater than a semicircle. It wasn’t the ideal way to have class and discuss student work. But for the last day of class, it wasn’t bad. I co-presented a power session at the T3 International Conference Sunday morning, and I’ve posted the stories that I shared of Running around a Track I and Running around a Track II. I have also posted Running around a Track III during which I processed the feedback we received during and after the sessions. Several participants asked about the time that rich tasks take, and so I thought it might be helpful to think about making time for tasks in this separate post. I enjoy teaching on a block schedule. I know I don’t feel as rushed as I would otherwise. But a friend asked me how often we do these types of tasks in our classes. How often do you do this type of rich task? There are some tasks through which the math content can be initially and naturally be learned. I think of Placing a Fire Hydrant (and last year’s notes here) and Locating a Warehouse (with last year’s notes here). 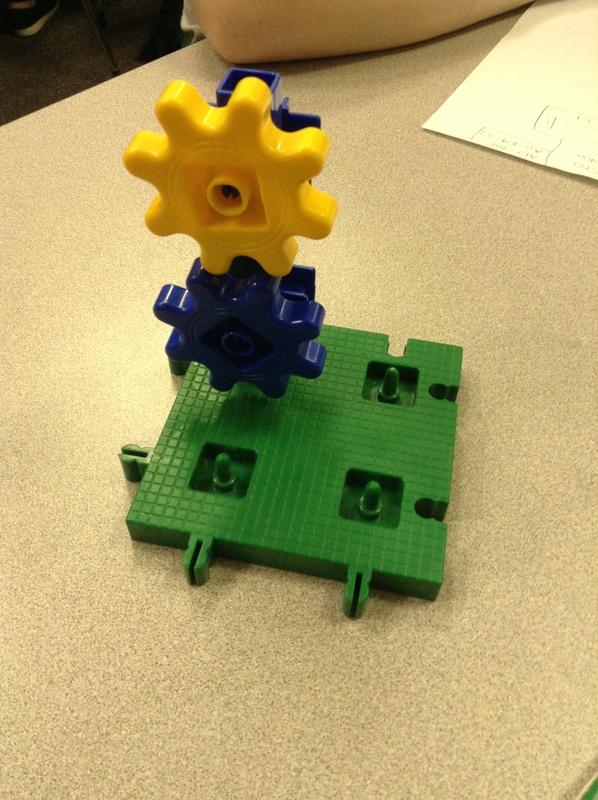 There are some that are more culminating tasks for a unit, especially the modeling tasks. A typical unit for us lasts about 8 days. (See some of the Unit Student Reflections posts to know more about how we organize content: Special Right Triangles, Dilations.) We do the culminating performance type tasks 1-2 of those days towards the end of the unit. On the other days, we are learning the content using practices such as look for and make use of structure and look for and express regularity in repeated reasoning, but not always through tasks. 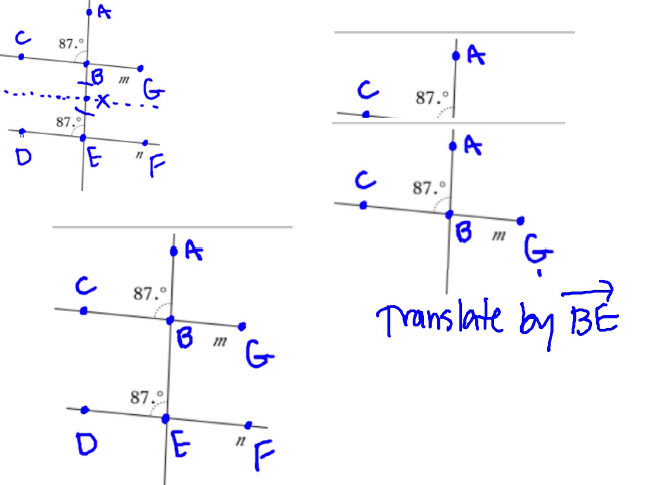 G-C.A.2 Identify and describe relationships among inscribed angles, radii, and chords. 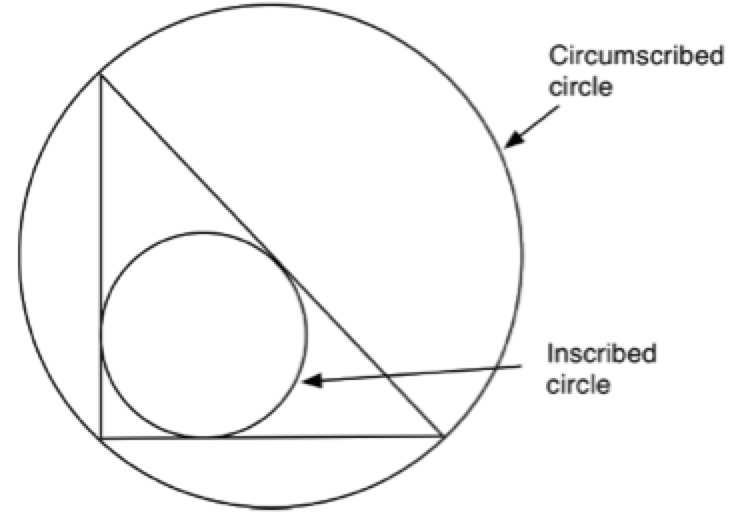 Include the relationship between central, inscribed, and circumscribed angles; inscribed angles on a diameter are right angles; the radius of a circle is perpendicular to the tangent where the radius intersects the circle. I find that exploring the relationships using technology first, verifying conjectures using formative assessment questions (more skill-based practice), and then moving towards why works best for my students. If you know of a good task for learning G-C.A.2, I would love to know. But for now, at least, we end this unit with a few culminating tasks instead of beginning the unit with them. The culminating tasks are Circles in Triangles, Inscribing and Circumscribing Right Triangles, Temple Geometry. I will note that while we didn’t actually do the tasks until the end of the unit, I did show students one of the diagrams from the beginning so that they could keep in mind throughout the unit where we were heading. So now that you know that I don’t give a rich task every day, let’s think about what steps we might take to reduce the class time for the tasks. 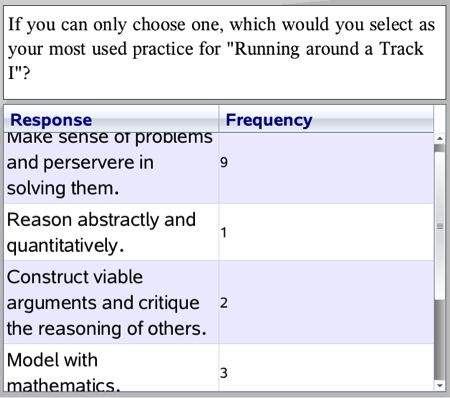 [These questions and comments will make more sense if you have looked at how the lessons for Running around a Track I and Running around a Track II played out with my students.] One of the participants in our Sunday session wondered what would have happened if I had given the students a teaser of what was to come the day before this lesson. What if I had shown them the picture and asked what they wondered then? Or sent a link to a Google form for them to submit their question outside of class? 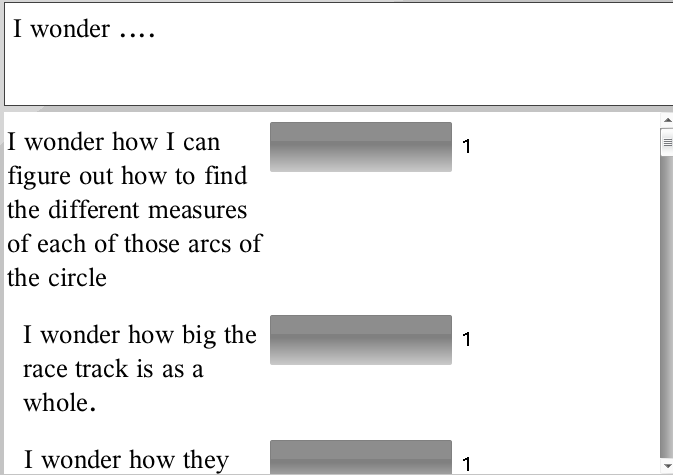 Or what if I actually showed them the tasks and questions (blacking out information in I that would give away II or vice versa) just so students could begin the process of thinking about the structure of the track before they did any calculations in class? I think these are great ideas – having students spend the “alone” time for processing the questions being asked could definitely make the time spent on the task take less class time. 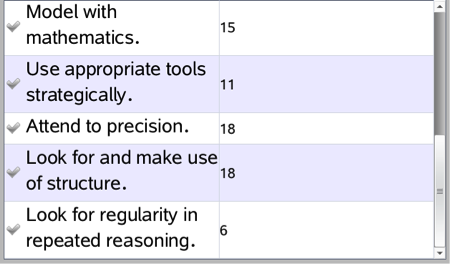 Someone else asked about how rich tasks complement some of the skills practice that students need. We don’t get to every practice problem that we include on our student handouts, but I have finally had the time to work through them, and so I post the worked handouts online for students to check problems they do outside of class for additional practice. We also give online practice assignments with two chances to students through Canvas so that they can get immediate feedback on what they know and don’t know. We are trying to teach our students how to use formative assessment. My students and I have explicitly discussed in class that if you take the online practice assignment and miss every problem, you should make a learning adjustment before trying again. So if I don’t use a textbook, how do I plan my lessons? But it does take time. I am lucky to work with a great team of geometry teachers who are willing to help and try tasks and use formative assessment with their students. We taught our CCSS Geometry course last year for the first time, and our administrator worked it out so we could have 4 teachers and 30 students in our first block class together. We worked through the lessons together with the students and each other, and then the other 3 teachers had a planning block after that class so that they could correct everything we had done wrong the first time before they taught it in their own classrooms the rest of the day. This year, we have a team of Algebra 2 teachers doing the same thing, and next year, our Algebra 1 teachers will teach one class together. I didn’t know what my administrator would say when I proposed this idea to him, but I’ve learned it doesn’t hurt to ask. It was a total scheduling pain, and some of our other classes were more crowded, but that was worth the sacrifice for what we learned teaching the first class together. I’ve just told you what works for us in our efforts to include more rich tasks, but it’s only one perspective. What works for you? What additional sites do you use to find rich tasks? Do you start with them more often than end with them? We’d love to learn more from you as the journey continues … easing the hurry syndrome, one task at a time. 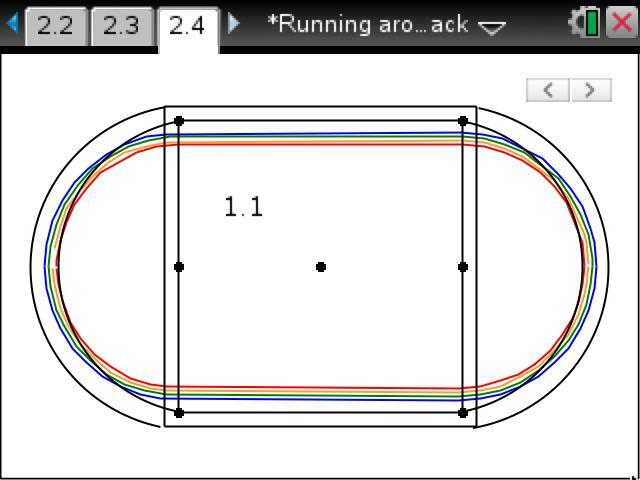 I co-presented a power session at the T3 International Conference Sunday morning, and I’ve posted the stories that I shared of Running around a Track I and Running around a Track II from the Illustrative Mathematics tasks Running around a Track I and Running around a Track II. In this post, I want to process the feedback that we received from the participants during and after the session. (There is not really an IM task called Running around a Track III, although there could be one from some of the suggestions participants gave for extensions!) Several participants asked about the time that it takes to do rich tasks in class. I’m going to address that conversation in my next blog post, Making Time for Tasks. The tasks have students make sense of the lanes on an Olympic Track. One participant didn’t understand why I changed tasks with the two classes. I neglected to explain that during the session. I was really just doing an experiment to see how the tasks were different and how students approached them depending on the given information. Was one easier for students than the other? Did I need to scaffold the tasks for my students differently than they were written? Were students more successful with one task than with the other? On Saturday, I went to a session by @bamentj from Darwin, Australia and learned about TodaysMeet. I wondered about using it as a backchannel during the session. A lot of participants were using Twitter throughout the conference, but we wanted a place where participants could interact with each other more than usual in a large session – and not get lost in the conference hashtag (or use two hashtags to make a subset of tweets for our session) being used by the other power sessions as well. Even though this meant that others at the conference wouldn’t find out as much as they might have otherwise about our session, we still wanted to try it. We made a room called CCSSPower. The link will only be live through March 15, 2014. Several times we asked participants to use the protocol “I like, I wish, I wonder …” to provide feedback. So it turned out that we didn’t use TodaysMeet as effectively as we could have. In fact, one of the first posts I read was from Joe: I wonder what the purpose of today’s meet.com is. I did not see the use other than to post comments/questions that never were answered. My reply, after the session (in 3 posts): Hi, Joe. Thank you for your comment. If we were to use TodaysMeet again, we would have a second projector to observe and use the comments. I like that the back channel can give participants a chance to communicate, whether or not the instructors are able to address the comments. But I will definitely use it differently if I use it again in a session. I’ve also thought since my post, that since we had co-presenters, whether or not we had the second projector, one of us could have been monitoring a second computer with the backchannel while the other spoke. We learn from our mistakes, right? As I have read through the other comments so that I could address some of the questions in this blog post that we didn’t get to address in the session, I will say that while we could have used the backchannel more effectively, it wasn’t a disaster. Those who were on the backchannel were having their own conversation. Several of the questions did come out in our whole group discussion, and some questions were answered by others in the backchannel without the presenters having to get involved. One participant liked the pre-assessment ACT question being the same as the post-assessment. 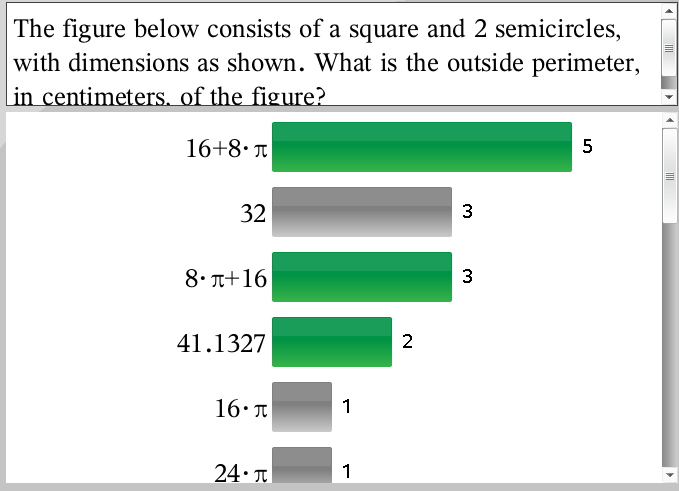 I am glad that one of the teachers on our geometry team had the idea to include the question in the lesson. I would not have thought of that myself. I looked back at Running around the Track I this week and noticed that one commenter suggested that the content in parts a and b of the task was on a grade 7 level. That might be true, but especially in this first year of CCSS implementation, the data I received from sending the ACT question without choices at the beginning of class (around 50% correct for both classes) indicated that our students had not thought through the mathematical content in the task before. Several ideas for extensions came out during the session. 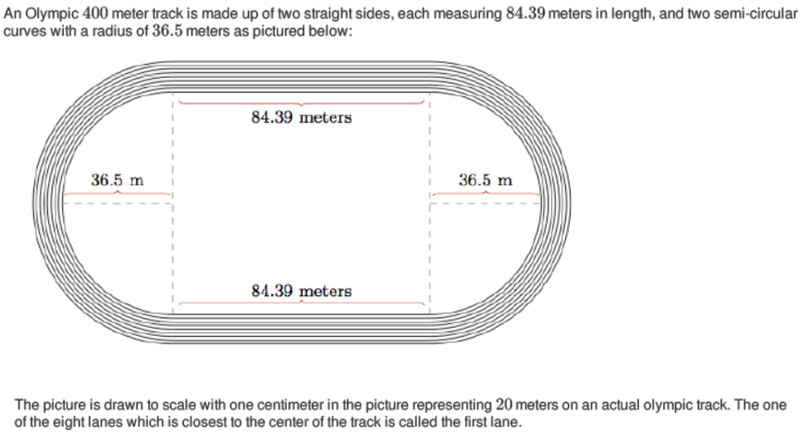 What about having students also calculate area of the track for the ACT question? 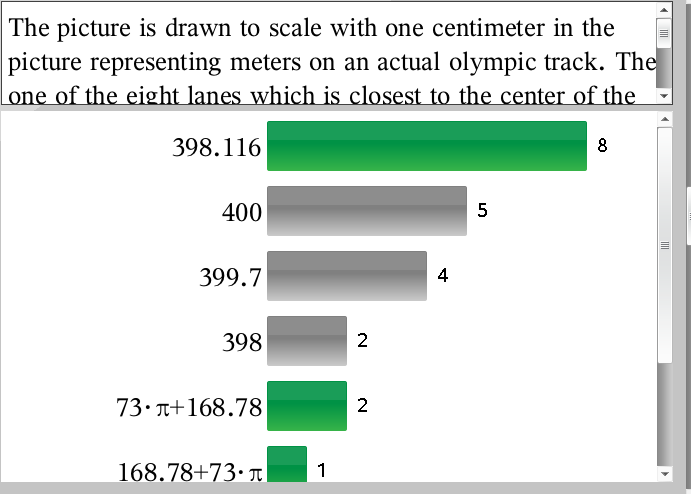 What about having student calculate the amount of paint needed for the lanes? 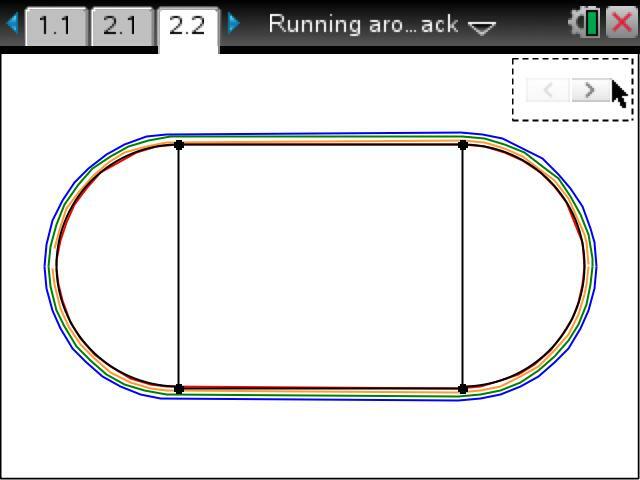 Could you have students measure a local track with a trundle or wheel? It occurred to me that it would be nice to take students to the track for the lesson. And then it also occurred to me that it would add at least 30 minutes to the time of the lesson for a visit to the track. I will note that one student in particular was engaged by this lesson more than any other this year. I asked him recently what his career pathway was, and he answered in all serious that is was to be a professional football player. He was an expert in class during this lesson. Another suggestion was to use a video. I agree. If you find the right clip, please share it with me! I started by looking for a clip, but those that I found were longer than I wanted to use, and longer than I had time to search for the perfect segment to watch. 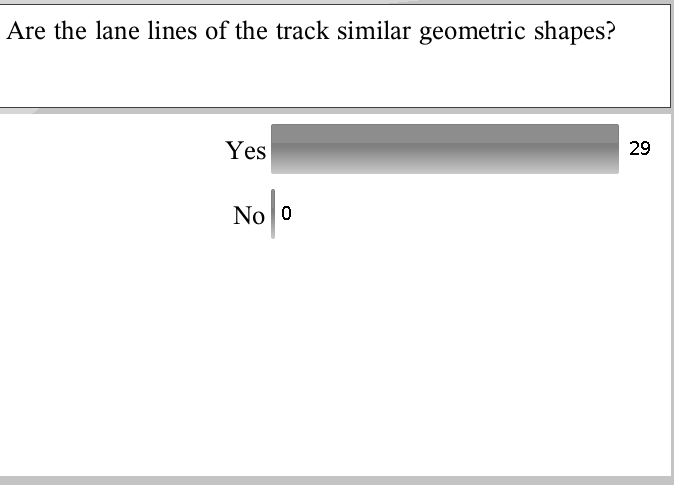 With regards to everyone missing the question about whether the lane lines were similar: If everyone got the quick poll wrong, I wonder how they would respond if you told them the answer is “no”, could they rethink their reasoning. I wonder how you selected the student to present his “wrong” answer? Perseverance is a best practice that we have to facilitate in our classrooms. FYI while we were doing the 400 meter question…US women won the 4×400 meter gold at worlds in Poland. What do you in your classroom when everyone gets a wrong answer? If you decide to have someone explain their work anyway to correct incorrect thinking, how do you select students to present their work? Do you use a random student generator (we have one where we check roll in our PowerTeacher grade book)? Or “equity sticks” (usually tongue depressors with student names – some teachers replace and some teachers don’t replace when you call on students)? Or keep a clipboard with notes about whom you’ve chosen for whole class discussions? I’ve been trying the latter this year. It’s not perfect, but it is a start to at least paying attention to how often I call on students. And so the journey continues … collaborating with educators from all over the world to improve our classroom practices. Thank you for the opportunity to learn from you, and thank you to Ellen from Illustrative Mathematics for sharing such great resources with us during the session and giving us a preview of what is coming soon to their website. I gave a different class of students Running around a Track II recently. I started by showing them the same picture of the start of the 2012 Olympic Women’s 400 M race. I changed the prompt, though. What do you wonder? Next, I sent out a Quick Poll of a question from a released ACT that students should be able answer as a result of the lesson. Who already knows how to solve this? Who knows how to solve it quickly, since the ACT is timed? I removed the choices, just to see how students answered without them. We didn’t talk about the results. I told them we would revisit the question at the end of the lesson. 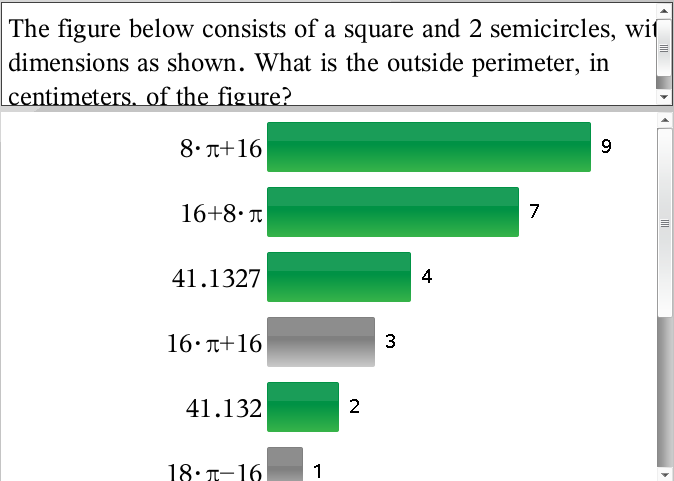 Just less than half of the students had it correct initially: 14/31. Before we started analyzing what was happening with each lane, I asked the students whether the lane lines were similar. Just for the record, I wouldn’t have thought to ask this question on my own. It was suggested in the commentary for the task on Illustrative Math, so I thought I would try it. I’m not sure I really had a backup plan for this formative assessment check. Not one student got this correct? How should we proceed? Understand that at this point, the students don’t know if everyone is correct or no one is correct. There is a great feature of Navigator that lets me “show correct answer” or not. While I monitor student responses with my projector screen frozen, I decide whether I will show the correct answer. What does it mean for two figures to be similar? Several students wanted to answer. I called on F.K., because F.K. loves dilations, and I knew that she would explain similarity in terms of transformations. Two figures are similar if there is a sequence of transformations including a dilation that will map one figure onto the other. 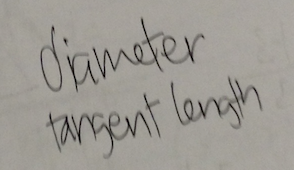 Okay – so can we describe a dilation that will map one lane onto another lane? What would be the center of the dilation? At this point, we moved to the technology. I had created the track on a Graphs page of TI-Nspire. Mainly because I wanted to prove that I could without asking my technical author friends Bryson and Jeff. It’s not beautiful, but it is functional. I didn’t even use this document in the class with Running around a Track I, but maybe it would be helpful now. I have a slider set up to change the radius of the circular part of the track. Are the lanes of the track similar? Does the technology help you see it? 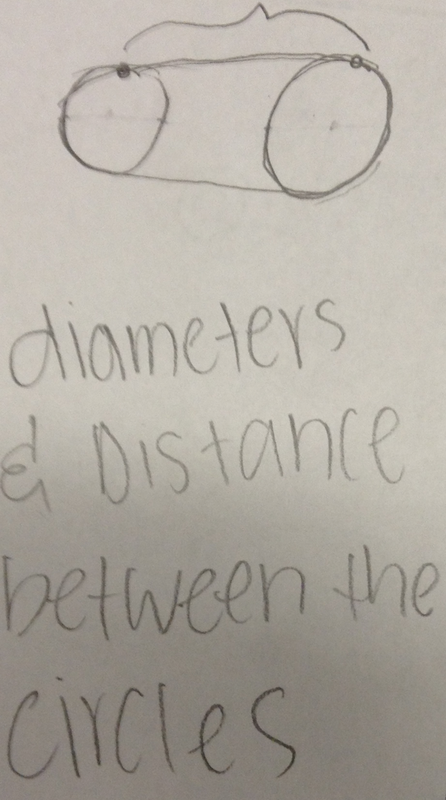 What happens if we dilate the straight part of the track about the center of the track by a scale factor of 1.1? And then let’s dilate the circular part of the track using the same center. (Bryson and Jeff could probably figure out how to make this happen all at once – my track is in 3 separate parts.) 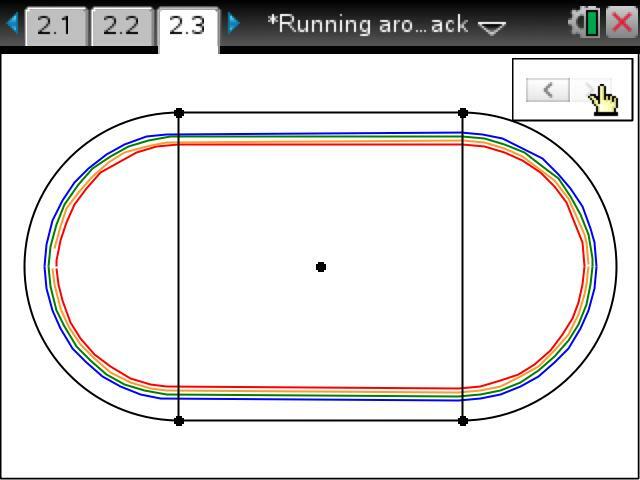 Is there a dilation to show that the lanes of the track are similar? The straight part of our track is a problem. There is no line that contains the center of dilation and the endpoint of each straight part of the track. 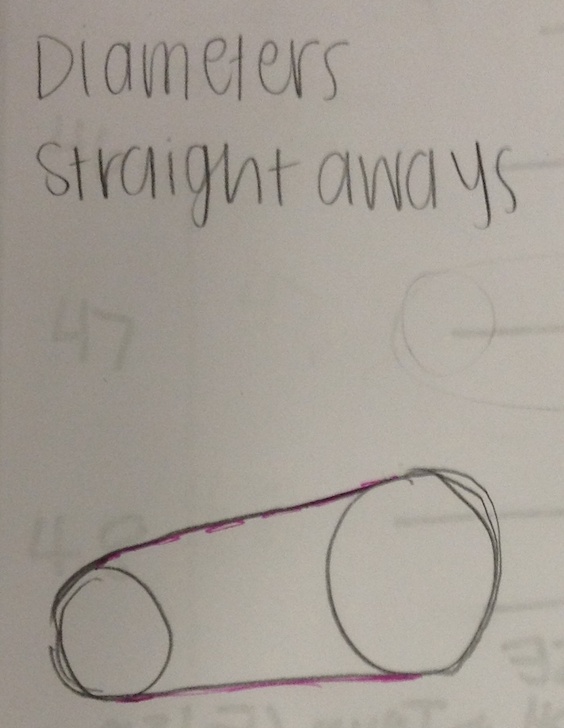 One of the students wondered if each one of those arcs are similar by using dilations. Now if we are just talking the arcs, then yes, they are similar using a dilation about the center of the arc – but not using the center of the track. The technology helped us make sense of whether the lane lines are similar. Now back to the real task. This task is a bit different – it has less scaffolding than the first task. Students jump right in to calculating the perimeter of the track 20 cm inside lane 1 and 30 cm inside lane 2 so that they can determine how far ahead the runner in lane 2 needs to be ahead of the runner in lane 1. I sent a poll to collect the results. It was disastrous, and the bell was about to ring. How in the world could I recover the lesson? We went back to the picture, and ended class by talking in more detail about the diagrams. We started the next class calculating the perimeter of the paint on the most inside lane. Even then, we didn’t have everyone with us. 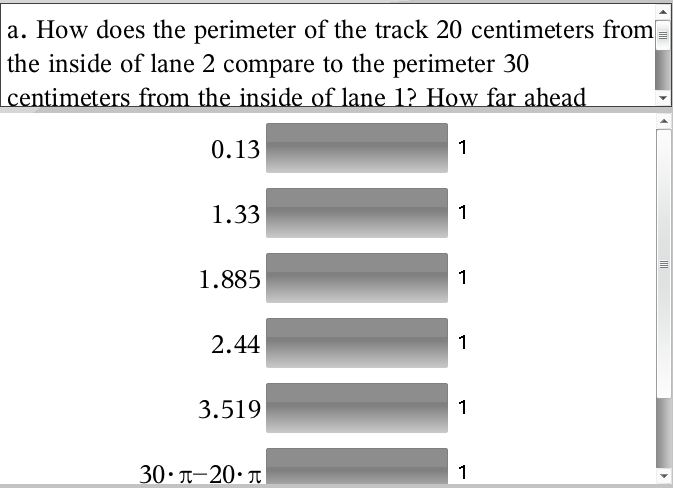 Don’t you love that 5 of my students just assumed the inside lane was 400 m without doing any calculations? 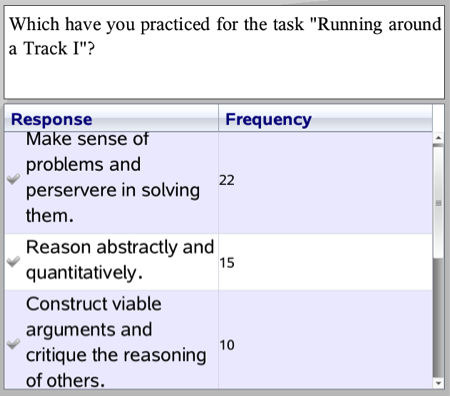 We went back to the questions on Running around a Track II, though and really did make progress. 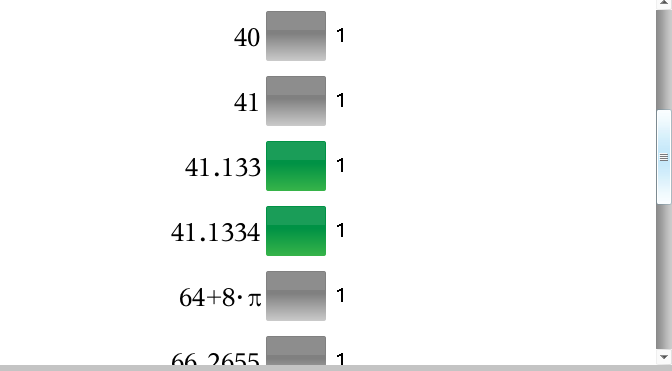 We are up to 80% correct, from just under 50% at the beginning of the lesson. And with choices, we have 90% correct. I finally showed the students the results and we talked about the misconception for choice C.
I think it is interesting to ask students which practices they used when working on a task. And which would you choose if you could only choose one Math Practice? I have shared before that my goal isn’t just to provide opportunities for my students to use the Math Practices in class – but also for them to recognize when they are using them. I ask my students to write a journal reflection each quarter on using a math practice. N.R. writes about this task: In class today and yesterday, we worked on a problem about the track of the 400 meter dash in the Olympics. While working on this problem, we used the math practice of modelling with mathematics. We applied what we learned about circles in this unit to figuring out how far apart runners in different lanes have to start in order to run the same distance and to end at the same area in the straightway section. 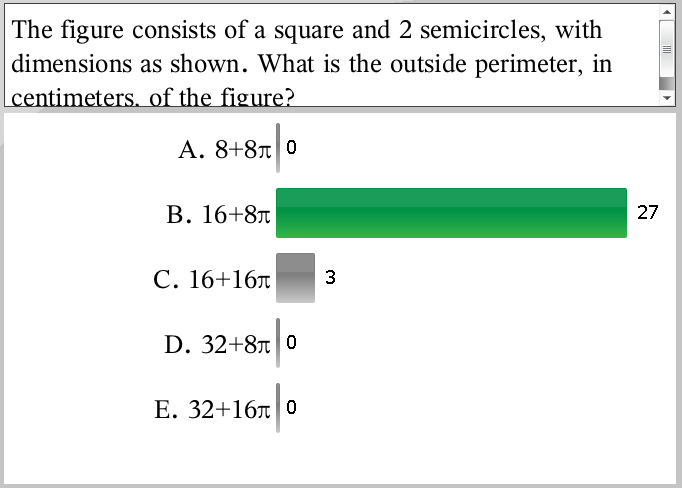 When solving this problem, I had to use the equations for circumference and perimeter and combine them. Once I finished working the problem, I decided that the runner in lane 1 has to start 7.037 meters behind the runner in lane 2. 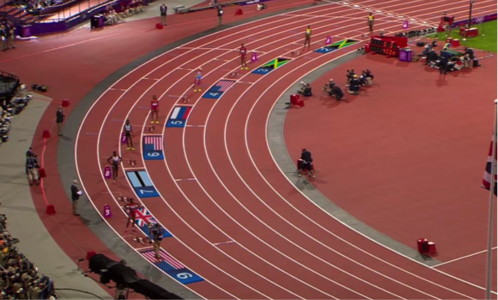 I also found that the runner in lane 2 has to start 7.666 meters in behind the runner in lane 3. This problem has helped me to be very attentive to detail. In this problem I had to be very careful that I worked everything correctly and completely. We tried Seven Circles I from Illustrative Mathematics a few weeks ago. At the end of class one day, I showed students the diagram and what question they might explore with it. I collected their responses using an Open Response Quick Poll and have shown the results below. Some students were interested in the space between the circles. 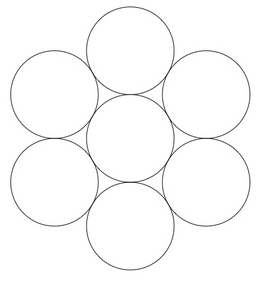 Other students wondered whether the circles were congruent. The task is given below. My students felt like it was pretty obvious that this could work with 7 congruent circles. I gave them different sized coins so that they could play. What if the circle in the middle is not congruent to the others? Will this work for 6 congruent circles? Or 8 congruent circles? 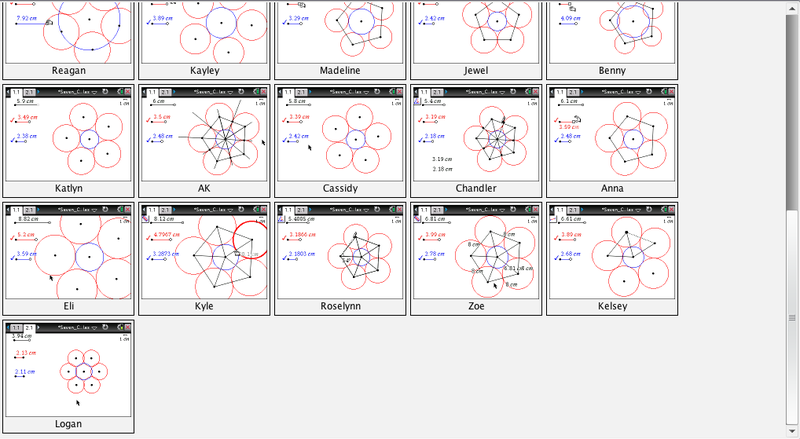 After students played for a few minutes, I sent them a TNS document that a friend made to explore this task. 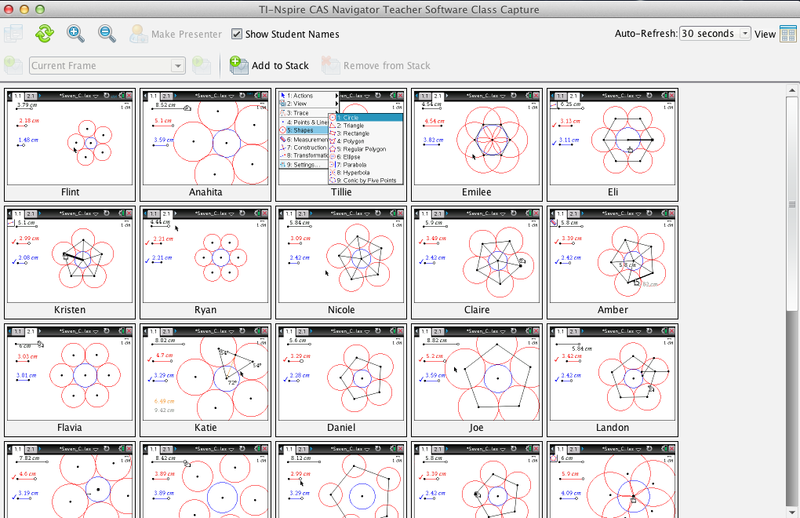 I used Class Capture to watch while students used the technology to make sense of the necessary and sufficient conditions for 6 circles and 7 circles in the given arrangement. Who had something interesting to discuss with the whole class? 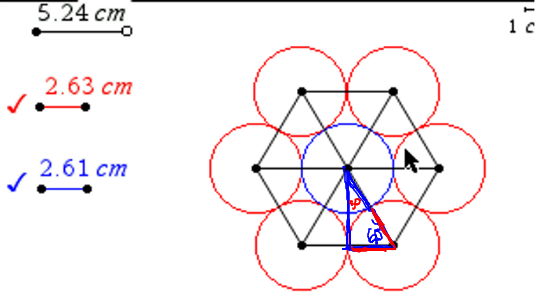 Many students saw the regular pentagon or regular hexagon with vertices at the centers of the outside circles and used that to make sense of the mathematics. While I was watching them, I was trying to figure out how we should proceed as a class. We started with Claire’s work. What do we know? We saw a dilation. We saw central angles of a regular pentagon. We saw isosceles triangles, which we bisected to make right triangles. We saw an opportunity to use right triangle trigonometry. We looked for and made use of structure. We reasoned abstractly and quantitatively. And before the bell rang, we looked back at the picture with 7 circles and recognized that the 30-60-90 triangles require that the radius of the center circle equal the radius of the outer circles. We only touched the surface of what we can learn from this task. Last year, we didn’t even do that. Last year, I shared the task with students during their performance assessment lesson, but we spent all of our time on Hopewell Triangles. This year, we got to it, but I know that our exploration could have been better. We began to answer what are the necessary and sufficient conditions for 6 circles. And in the process, we came across an argument for why the 7 circles must be congruent. But we didn’t really solve the conditions for 6 circles.